Students from the UO's Department of Planning, Public Policy and Management (PPPM), participating in the Sustainable Cities Year Program (SCYP), presented the final plans from their fall term projects this month to the city of Medford. The group of first-year graduate students enrolled in Introduction to Planning Practice, Human Settlements and Planning Analysis-I focused on encouraging new development. Students developed and presented a final report on how the Jackson County area can continue transitioning into more sustainable, efficient practices. The students’ efforts included a site visit early in the fall term to Medford City Hall, where six city staff members presented their priorities; an overview of the city; the background and history of Medford; and information about the specific site where the classes would be working. The visit included impromptu conversations with interested and curious community members who were also assessing the site -- an area on East Main Street where many of the city’s health development services are located. Assistant Professor Rebecca Lewis, who taught Human Settlements, thought the biggest gain of the Medford visit was hearing how people who worked and lived in the city wanted the area to change in the future. “It was great to go around the site and get a feel for it,” she says. Students created overall plans that incorporated all aspects of the community. They determined if bike lanes would be useful, if buildings could be repurposed or rebuilt and if parks should be incorporated in the area. They also determined how redevelopment could affect traffic in the area and impact nearby neighborhoods, and the best ways to maintain the character of an area. The students’ final proposals were meant to spark conversation within the city and community about how the area can develop in the next 10-20 years. 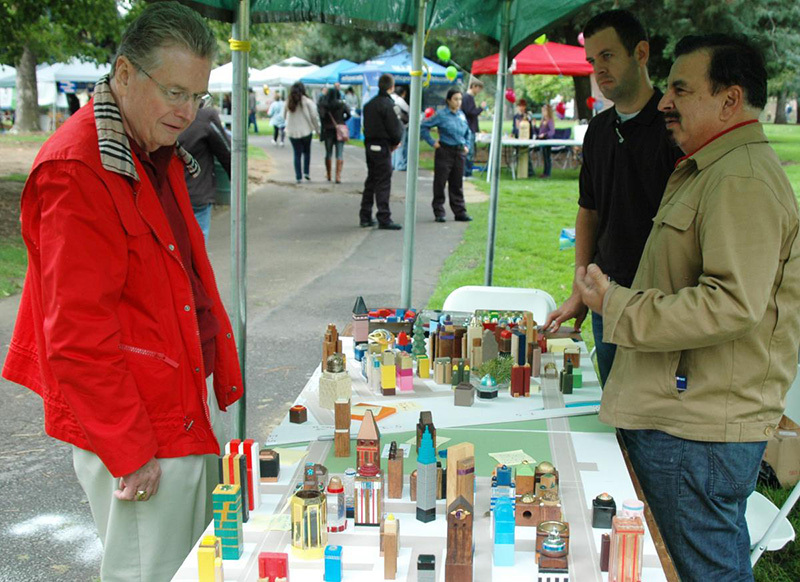 Additionally, Assistant Professor Gerardo Sandoval’s project to reach out to Latino communities in Medford was featured at a multicultural fair where visitors to the SCYP table were able to use models and 3-D objects to share their concerns about and vision for Medford.